We had two jungle plots; my mother’s had coconut trees and, beneath the coconut trees, the food crops that we cultivated. Separately, my father had a small coconut plot farther up in the mountains. 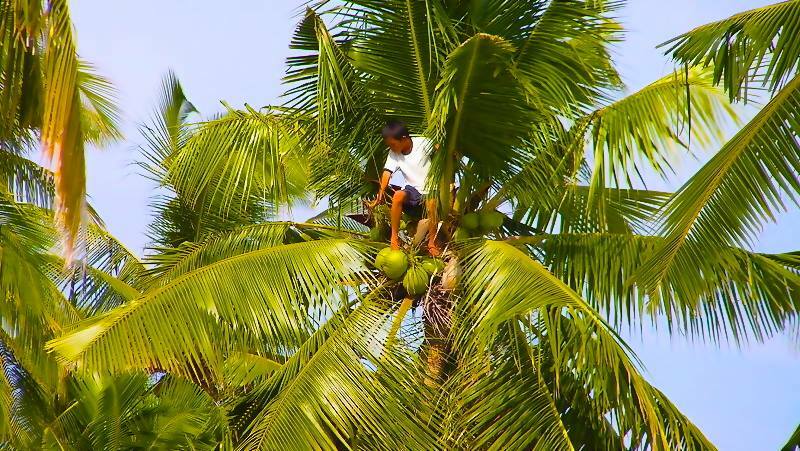 A coconut tree will yield four crops in a little over a year; so quite a few times each year my father and brothers would be responsible for harvesting the coconuts and making copra from them. Copra is dried coconut meat, also called “kernels”, and it is used to make coconut oil, which in turn is used for cooking, or as an ingredient in beauty, detergents and other products. To make copra, my father and brothers would hike into the jungle hillside to the plot that was ready for harvest, and they would first climb the trees and collect the coconuts. I always wanted to go with them, because I could climb coconut trees and I wanted to be part of the harvest, but they always said no. The hike up to the farm (particularly my father’s) was too difficult and it was necessary to stay there a week or more. A half-hectare plot might yield as many as 2000 coconuts on a good harvest. Next, the shell is removed. This is done by pounding the shell on a sharp stake, causing the outer husk to split and fall away. You are then left with the coconut itself, which is then split in half, drained of water, and then dried using a combination of fire and sunlight. Drying too quickly over heat can harden the meat and keep it from drying properly; and sun drying can allow mold to form, so it has to be carefully watched. For the most part, drying over a mild heat is the main way that it is accomplished. Eventually the copra is ready, and at that point it is bagged and a karabao (our word for water buffalo) pulling a cart is rented and brought up the narrow trails to the farm and the copra is loaded and hauled down. When coming from my mother’s plot, they could bring the copra all the way to Guinob-an; but for my father’s plot, which is much farther away, the karabao would take the harvested copra down to the river, where one of my brothers would be waiting with a boat. The next step is to take the copra to Tacloban to sell it.